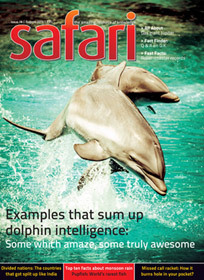 The May 2014 issue of Safari, a knowledge and science magazine from India, hit the newsstand a few days ago. We were curious to pick it up and get the content details for the same to our readers, as usual. Here are our personal views and reviews for the same. Having a picture of Kea (a kind of parrot found in New Zealand) on the cover page makes it look like a wild life magazine. The inside cover page contains a high resolution picture of a Redwood (a tree native to USA). The image is worth a watch with the informative block written about the same. The editorial is missing like the other issue of this magazine (English version). The editorial gives a way to connect the editor of the magazine to the readers, where he/she can talk about his vision about the stuffs integrated in the specific issue of the magazine, and hence is important to be there. Do you believe that a car can be run just using compressed air as the fuel? That also with the maximum speed of 110KMPH and having a capacity to run of 200KMs? On first glance it seems like we are in the fantasy world dreaming something which can give us a relief in the scenario of ever-growing price of the petroleum products, right?! But you can read a small introductory article about a car Mini-Cat to know more about this little known car. The article is added with an illustration of the car showing the basic mechanism of it. Space Missions are destined to remain in talks for various reasons. This magazine brings a small informative piece of information about the first traveler to the space! The article is integrated with two photographs as an aid to the content. It is said that truth is stranger than the fiction. Very true. For example take the case of a bird which set a record of nonstop flying for 200 days!! Bird lovers will find a small article about this record interesting. There are several aids we got so used to with, that we never though about their origin. And it found too simple to though about their invention and background! For example take the case of Safety Pin. We use it on almost regular bases. But do most of us know about the Invention of the same. Only curious fellows (who otherwise purchase such knowledge oriented magazines?) find a small article exploring the discover of Safety pin, worth a read. Do you know that there is a species known as Cricket or crickets?! These insects are known for the natural music they can produce, which is known as chirping. Ravindra Acharya’s four page long article in this magazine brings the information available on Wikipedia and some other sources in rather interesting manner. The article is armed with photos and illustration. A lot of people will think that there is something wrong in the title of the article as, when talk about Cricket, people mainly think about the game/sports. The article is worth reading for sure. There is one more article by the same author about the interesting balancing acts. The article is dedicated to rocks and other gigantic stones and stuff which have a very small base to balance itself and still they remain steady and solid that it looks unbelievable at the first glance. The article is full of images and illustration with scientific explanation of the balancing stuff. It is not only interesting but also a must read article from this issue. We know the phrase junk-food. And we refer it to the unhealthy (but tempting in most cases) food we consume. And we all consume it at various places and time. But there are people who ate something which you can literally call “Junk Food”. What you think about the people who eat glasses, nails and other such stuff? We read such cases often in newspapers and magazines. We see such stuff in various magic shows and even got to see on some TV shows. The records of Guinness Book contains remarkable number of such cases. A very detailed article with photographs regarding such eating-dis-order (:)) is found in this issue. Those who are curious to know about such stuff will surely like to read the article. The fast fact segment is dedicated to garbage on the mount Everest. It was so pure till it was unconquered, but now with the growing number of visitors it became a dustbin (located at the highest place on the Earth!). There are several cleaning missions are taking place over time intervals, to keep it as clean as possible. Read about various aspects of the issue and people’s effort to resolve it in a small and summarized article about the same. 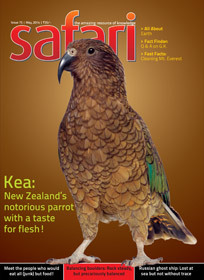 There is a six page article about Kea, a bird found in New Zealand. Interestingly a gathering group of Kea is known as a Circus! The bird is dangerous in various aspects as it has developed the taste of Flesh. It often strike on the livestock (the pet animals) and kills it. For the country which have a very large dairy-industry; the livestock is important and essential. This article about Kea brings in detailed information about this bird and the mishap it cause. Most of the facts about this birds are unknown to the majority of people living in different content. The article is worth to read. The nature is full of variations. You may not think about a tree with the shape of a funnel, right? Usually trees are in the shape of a mushroom. It is natural shape for the trees so they can use its trunk and branches to get the water through its root and distribute it to all the segments of the same. But in Yemen the trees of the shape of funnel also found. With this shape they can “milk” the water from the clouds. A small article about these tree interest the people who love to explore natural wonders and Zoology. There is an article about a Russian ship named “Lyubov Orlova”. This 4,500 tonne ship was around 90 meters long and 16 meters wide luxury cruise. The ship was lost at the sea and is known as ghost ship as the traces of the same are found occasionally. The article is written like a thriller and it is an interesting read. Of course it narrates the facts but in very interesting way. Why does a straw, when inserted in a chilled soft-drink bottle rise out on its own, and, at times, fall out of the bottle? What causes noise when we crack our knuckles? Explain with the aid of illustration. How many Indians speak English language? While the Sun appears yellow, why does the Moon, which reflects the Sun’s light, appear white? Why the magnetic power of a permanent magnet does not weaken even after repeated use? Chemical fumigation is often done to control the menace of mosquitoes. These fumes can come in contact with fruits, vegetables and other foodstuff kept in the open. Is it not harmful to consume such foodstuff? Why are some medicines prescribed to be taken after food and some on an empty stomach? What is a Blu-Ray disc? How much data can it store? How is it different from DVD? One light-year equals how many kilometers? Why is it generally easier to remember a person’s face but difficult to recall his/her name? Which newspaper holds the record for maximum number for pages? How much oil (fossil fuel) is still available under the ground? How long will it last? The last cover page contains an article exploring – All About Earth. Overall the issue of the magazine is balanced in nature oriented, knowledge oriented, interesting articles. It is definitely worth reading and much better choice then some cheap standard stuff available in the market these days. As the exams are over in most areas, it is a good choice to go for this magazine to get some really good reading during the vacation period and beating the heat. Are you going to read this issue of Safari? 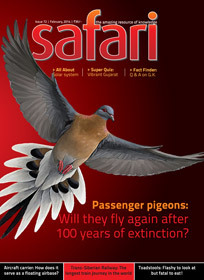 Are you regular reader of Safari magazine? Do share your thoughts about this issue (or any other issue) of the magazine via comments below. If you like this article then do not forget to share it with your friends on various social networks like Facebook, Twitter, Pinterest, Google Plus, and others.